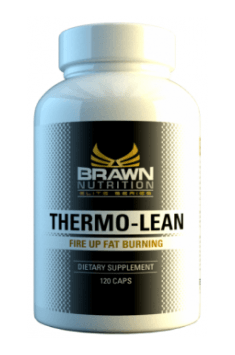 Brawn Thermo-Lean is a dietary supplement facilitating the reduction of body fat. The modern formula contains substances with synergistic action, which through several different mechanisms guarantee the desired effect. Thermo-Lean contains proven ingredients, such as caffeine, green tea extract (50% EGCG) and fucoxanthin, which are widely used in fat burners. In addition, the preparation has been enriched with a few additional ingredients that increase its effect - the patented formula of Pure Energy, alpha GPC, Stearoyl Vanillylamide and 3,5-diiodo-L-Tyronine. Fat reduction is a complex process that requires the entire body to work together. The fatty acids must first be extracted from adipose tissue so that they can be used as fuel. They must then be transported to the mitochondria, or cells that convert nutrients into energy. It’s only there that they undergo beta-oxidation, or colloquially speaking - burning. The mixture of ingredients contained in the supplement works on each of the above-mentioned processes, and further improves the functioning of the nervous system, so that the reduction of body fat will not be a problem anymore. Caffeine - the most commonly used stimulant in the world, which has proven support for fat loss. Due to the similarity of caffeine to adenosine molecules, it has the ability to bind to the adenosine receptor, and thus - blocks its availability. Adenosine is a neurotransmitter that inhibits the nervous system and is responsible for feeling tired. Limiting the activity of adenosine with increasing the release of other neurotransmitters (such as acetylcholine, dopamine, and adrenaline) makes caffeine an extremely effective ingredient that simultaneously stimulates the body and delays the fatigue. In addition, caffeine is attributed properties that support the reduction of adipose tissue. Caffeine contributes to the increase of cAMP levels - it stimulates the process of AMP conversion into cAMP, as well as slows down its degradation (inhibits the phosphodiesterase enzyme responsible for the cAMP distribution). cAMP is a transmitter initiating the lipolysis process, thanks to which it plays an important role in weight reduction. Green tea extract (50% EGCG) - EGCG, or epigallocatechin gallate, is the most potent polyphenol found naturally in green tea, showing strong antioxidant properties. EGCG works synergistically with caffeine - it has been shown that a dose of 500mg per day supports fat beta-oxidation and thermogenesis. In addition, it can improve insulin sensitivity, which is desirable not only for reducing body fat. Green tea extracts are also used as substances supporting cognitive functions (again, in synergy with caffeine, it prevents fatigue and helps to keep the mind clear). Alpha GPC (L-alpha-glyceryl-phosphorylcholine) is a natural source of choline that also occurs in the body's physiological conditions. Alpha GPC in the central nervous system functions as a carrier of choline and a precursor of phosphatidylcholine. In contrast to other commonly used forms (e.g. choline bitartrate), it’s able to cross the blood-brain barrier much more effectively and effectively raise the level of choline, which can then be converted to acetylcholine. Acetylcholine corresponds to memory and concentration, but it’s also the main neurotransmitter transmitting nerve impulses to our muscles. Research shows that Alpha GPC can increase exercise power and efficiency, as well as support the reduction of body fat, which is most likely associated with its effect on stimulating the production of growth hormone. Fucoxanthin 10% (Fucoxanthin) - another natural compound from the group of xanthophylls, i.e. plant pigments found most abundantly in algae. This association, according to research, promotes fat loss, especially from places where the fat is ‘resistant’, i.e. on the stomach. Fucoxantine works for thermogenin (UCP-1 protein), which is found mainly in brown adipose tissue, however, in one animal study UCP-1 enzyme activity was also shown in white adipose tissue. Thermogenin supports lipolysis and shows significant thermogenic properties. In addition, fucoxanthin supports lipid beta-oxidation and improves lipid profile. Stearoyl Vanillylamide is a compound very similar to capsaicin, a substance that gives the spicy taste of peppers. Stearoyl Vanillylamide, however, does not have an acute taste, but after (just like capsaicin) it affects the activation of the TRPV1 receptor (the so-called "capsaicin receptor"), contributing to the stimulation of the release of catecholamines, especially adrenaline and norepinephrine. Noradrenaline, by means of β3 receptors, participates in the regulation of brown adipose tissue (BAT) and also stimulates thermogenesis. In one study, it was further shown that oral administration of TRPV1 receptor agonists increased lipolysis and reduced the proliferation of fat cells in rats fed a high-fat diet. 3,5-diiodo-L-Tyronine (T2) is a less active thyroid hormone, having the ability to regulate the same genes as the triiodothyronine (T3) hormone, but in a much more subtle way (doses that would have the same effect would have to be about 100 times larger). T2 works much faster than the popular T3, which is often used by people preparing for a competition. The increase in serum T2 is noticeable after an hour, whereas in the case of T3 it’s only noticed after a day. T2 seems to be more secure - in small doses it does not affect the hypothalamic-pituitary-thyroid axis (HPT). Its operation consists of the metabolism acceleration, which is associated with the most important of the fat burning points - the acceleration of the lipolysis process and beta-oxidation. To sum up, Brawn Thermo-Lean is a comprehensive burner containing natural and proven substances. It works on the whole body, and the ingredients have been selected so as to synergistically support physiological mechanisms of fat burning. In addition, the preparation contains substances that support the nervous system, providing energy, better focus and motivation during training. Take 2 caps two times a day. First portions in the morning, second before physical activity or in the afternoon. An excellent supplement for people starting reduction diet, but also ideally suited to people who already have experience with burners. Thermo-Lean is quite gentle in action, but effective. You shouldn’t take this supplement too late - it can cause problems with falling asleep due to the caffeine content. NUTRITION BRAWN a respected British manufacturer of products designed for professional athletes. Products of this brand include dietary supplements helping with faster growth of muscle tissue that simultaneously strengthen tendons and joints. The offer also includes, protecting the liver, tauroursodeoxycholic acid, and supplements with high-quality ATD, which has a strong anti-estrogen properties. Gelatine, rice fluor, magnesium stearate. Protein supplement composed of 5 different protein fractions. Contains of BCAA, glutamine, digestive enzymes, and fiber. Supplement with whey protein and soy protein isolate in three flavors. Supports muscle building.